Vehicle/Deer Crash Season Is Here | Hupy and Abraham, S.C.
Large herbivores include mule deer, moose and white-tailed deer. Although many types of animals cross our highways, the larger ones are obviously the most dangerous to encounter. White-tailed deer incidents account for many crashes, injuries and deaths each year. Among the states with the most deer/vehicle crashes are Texas, Wisconsin, Minnesota and Iowa. Since I live in Wisconsin, and I ride motorcycle, I'll concentrate on some Wisconsin statistics, but the avoidance strategies hold true for any state or vehicle. When reviewing the states with the highest number of deer crashes, approximately 8% of car-deer collisions are fatal compared to about 70.5% fatality among motorcycle-deer collisions. It's obvious that there is less protection from injury while riding a motorcycle as compared to being inside of a car. 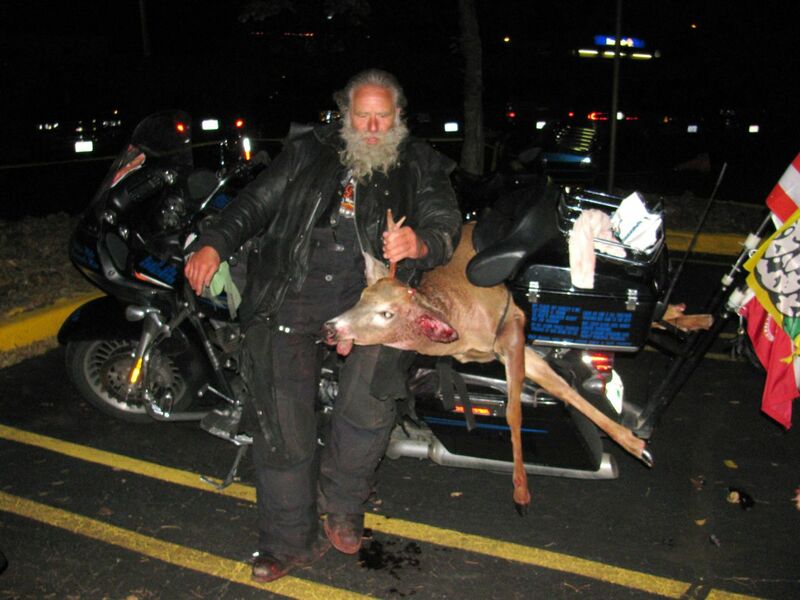 Former Wisconsin State Senator Dave Zien, after hitting a deer with his motorcycle in October, 2010. How can we prevent collisions with deer? First, we need to be educated about where and when me might encounter deer. Although October through December are considered months that deer are most dangerous, June is another month that logs a high number of collisions with deer. Deer are herd animals, meaning they don't usually travel alone. They forage in the woods but will come out to the roadway to eat grass or to escape pesky insects. They are usually on the move at dusk and dawn although you can encounter them at any time of the day. You may expect to see deer in rural areas but they are also in many urban areas. The thing that makes deer dangerous is they are unpredictable. Over the years, we learn other driver's habits and can predict what a car might do at an intersection and prepare for it. Not so easy to do with deer. They're not always visible before they run out onto a highway, and many times several deer will cross a roadway together or in single file. They might stop, frozen in your headlights, or stop and then reverse course just as you approach them. Sometimes sounding your horn will freighten them and other times they will just stare at you as if the noise is annoying them. There is no empirical data that deer whistles actually work, so we need to explore other ways to avoid collisions with these animals. In Wisconsin in 2011, four of the five vehicle-deer collision fatalities were motorcyclists. Whether in a car or on a bike, slow down when you are in areas of heavy deer concentration. Five to ten miles an hour slower can make the difference between a hit or near miss with a deer. Deer or migration signs should be taken seriously. brake aggressively (both brakes if on a bike) and swerve if you have room (swerving on a motorcycle has mixed reviews; some advise to brake and swerve toward the rear of the animal if there is room. Others say to avoid swerving all together if on a bike because a glancing blow would lay the bike down or the bike might leave the roadway). An excellent resource for learning defensive riding techniques is David Hough's "Proficient Motorcycling". Also, consider taking an advanced rider course to brush up on emergency braking and steering techniques. Good luck and be safe.